Who are Army of Believers? 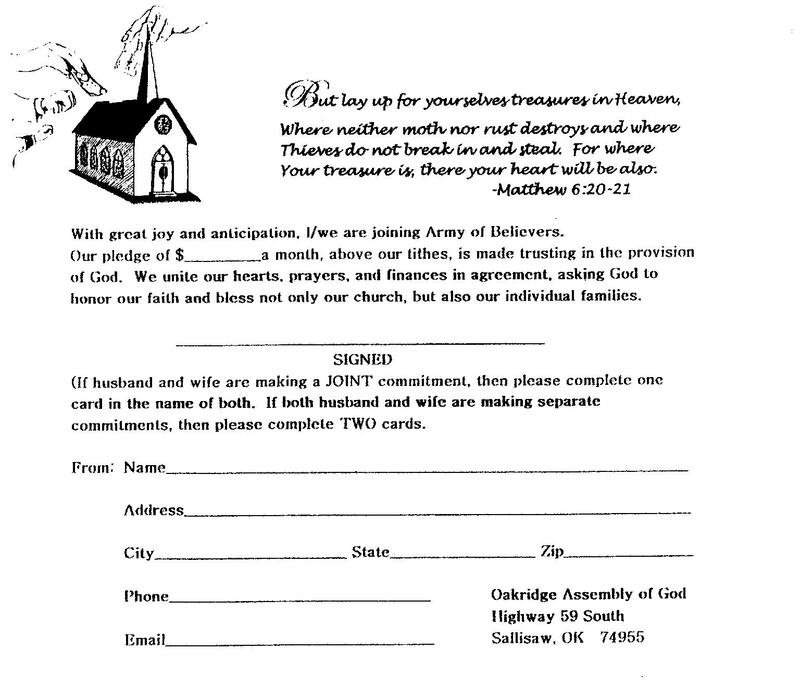 Army of believers are a group of people that make a monthly pledge, above their tithe, to help fund the building program at Oak Ridge Assembly of God Church. The pledge can be any amount that they feel God would have them to give. This means of support can be done on an individual basis or as a family. Just fill out the enclosed form and watch God provide! Fill-A-Cup is another way we are raising funds for our building program. Last year we began a campagain asking every family at church to save their loose change in a cup and turn it into the office. This is money that most people never even miss. We are starting to collect for 2015 So far we have collected over $400.00. All together we have raised over $15,000.00 for our building fund. Wow that is a lot of change and change adds up to DOLLARS! “Give and it shall be given unto you; good measure, pressed down, and shaken together, and running over, shall men give unto your bosom”… Luke 6:38. Kingdom Builders are a group of people that are committed to resource the Kingdom of God here on Earth. They believe that through sacrificial giving, the church can fulfill its purpose here on Earth without financial restrictions. This concept of giving is different from any previous fund raising effort or building program that we have previously done. Each Kingdom Builder commits annually to give $2,500.00 above and beyond their tithes to fund projects that would be restricted or eliminated within a normal operating budget. All the money that is contributed to Kingdom Builders will be used to finance projects that will require significant funding. Our first and foremost would be to pay for our new sanctuary, as the church membership has grown substantially in the past few years. Beyond that other projects are in the works that include but are not limited to; a playground,a ball field, outdoor pavilion, and a walking trail. We want to not only provide a place for members of our congregation to meet, but make it available to the community as well. Why do we need Kingdom Builders? We realize… That the future of our church depends on a strong undergirding of prayer. We dedicate to pray daily for our pastor, our church and those involved in this ministry. We know… That our sanctuary must be a welcoming, first-class facility with enough room to allow us to minister to our community. We know… That we must invest in our youth, as they will be our next generation of Christian servants and leaders. Therefore, we want to provide them a safe environment to play and develop in. We understand… That many of the things that we have planned and dreamed about will exceed our normal operating budget. We hope to make them possible through Kingdom Builders. If you have decided that you want to become a Kingdom Builder or a member of the Army of Believers and invest in a church that makes soul winning a priority, call the church office at 918-775-7371 and sign up today! What a wonderful opportunity!